Aftercare is the most important technical aspect of getting any kind of piercing, whether it is in your ear or you belly button. If you are serious about keeping your piercing, you need to look after it properly, which is why our aftercare products are designed to help fight any irritations or infections. We have a select range of oils, balms and sprays to choose from. If you are having any issues with your piercing such as inflammation or infection, we have products that can help. The first step in finding what the right aftercare is for you, is to figure out what you need. Below you can find different issues you may have and the products which can help. Daily aftercare is the most important routine you will need to follow when you get a new piercing. The first 6 months of piercing aftercare will be more important than the next 6 years, so be sure to have a plan and stick to it. The most important product you will need for daily aftercare is a mixture of salt and distilled water solution. Your new piercing needs to be cleaned twice a day with this solution. Salt is a natural cleaner and fights bacteria and dirt that may build up. The salt spray with tea tree is also suitable for people who may find bumps or spots popping up around their piercing. Combined with tea tree, a natural antiseptic, a salt spray is a must have from day one for anyone with a new piercing. As well as this, our piercing wonder oil is a wonderful nurturing product with aromatic scents. Once applied to the skin, this nourishing oil emits a pleasant scent, which makes a good combination with its nourishing characteristics, as well as being suitable for inflamed skin. As it does contain perfumes, it is best to avoid the wonder oil, and any other perfumed product for 2 - 4 weeks during the initial healing period. Another must-have in daily maintenance of your new piercing is a scented piercing balm. After the first 2 - 4 weeks of healing, piercing balm can be applied to dry or irritated skin to act as a soothing agent. They come in a number of perfumed scents, making them suitable for any occasion. Tip - For the best results a healthy combination of all three is recommended, but do not apply each more than twice a day. If you want to add a little bit extra to your healing process, then a healing oil or butter is what you need. Our special Healing Oil makes use of natural tea tree and macadamia oils to aid with healing and infections. The components work together to soften the skin around a piercing and help prevent any infections. As healing smoothly is the best way to avoid complications such as infection or rejection, a healing product is a way of managing this. 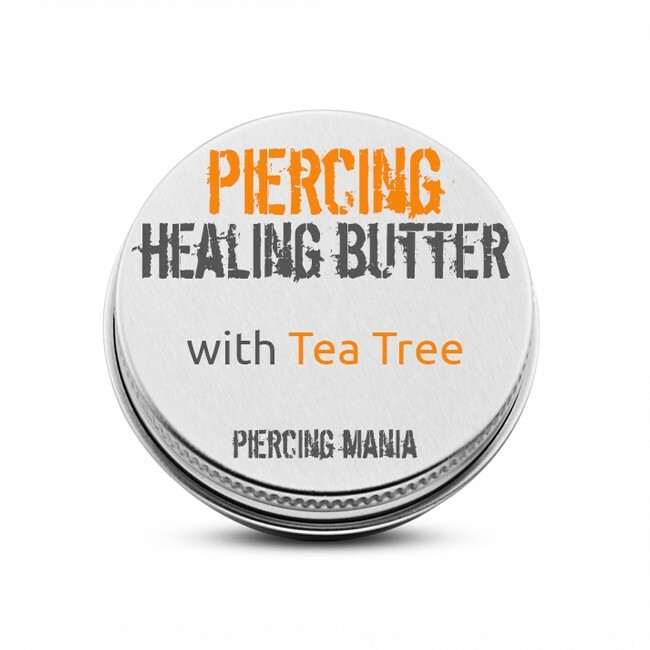 Our Piercing Healing Butter not only moisturises the skin around a piercing, it helps to try prevent further discomfort and infection. The healing butter should be used in combination with daily salt spray use to both heal and fight off infections. Neither of our healing products contains perfumes or additives and are 100%, which makes them perfect for immediate use. Getting started with the healing process early can make a huge difference sometimes, and although everybody heals differently and may not get the same results, it is important to take care of your piercing. Tip - Some people like to dip their piercing into the healing oil before inserting it to help the healing process. Rehydrating the skin around a new piercing can be a struggle. If you are suffering from dry or irritated skin due to your new piercing, there are several products which seek to moisturise piercings and rehydrate the skin. We have a couple of piercing butters which contain natural ingredients that work to hydrate the skin around a piercing. Sometimes skin can become flakey and dry, which is very uncomfortable. The butter rehydrates this skin. Our Original butter solution can be applied liberally as it is all natural. The same goes for our For Her butter, but as it contains scented perfumes, it should only be used after the first 2 - 4 weeks to avoid irritation. Our butters are also used by people who are stretching their ears. They keep the skin moisturized which helps with the healing process. Another great way to help with hydration as well as stretching is with our 100% Jojoba Oil. Jojoba is actually a liquid wax rather than an oil and has a wide variety of uses, which include rehydrating dry skin, which is also very effective during ear stretching. That is why jojoba oil is very popular among people who are stretching their ears. It also has some healing properties which are an added bonus for people with new piercings. Tip - Dipping your piercing into jojoba oil or rubbing some butter on it will help lubricate the piercing, making it more comfortable to insert, especially if your skin is dry. Sometimes you may experience a little more discomfort or inflammation than usual, which can be a real pain, and obviously should be dealt with. 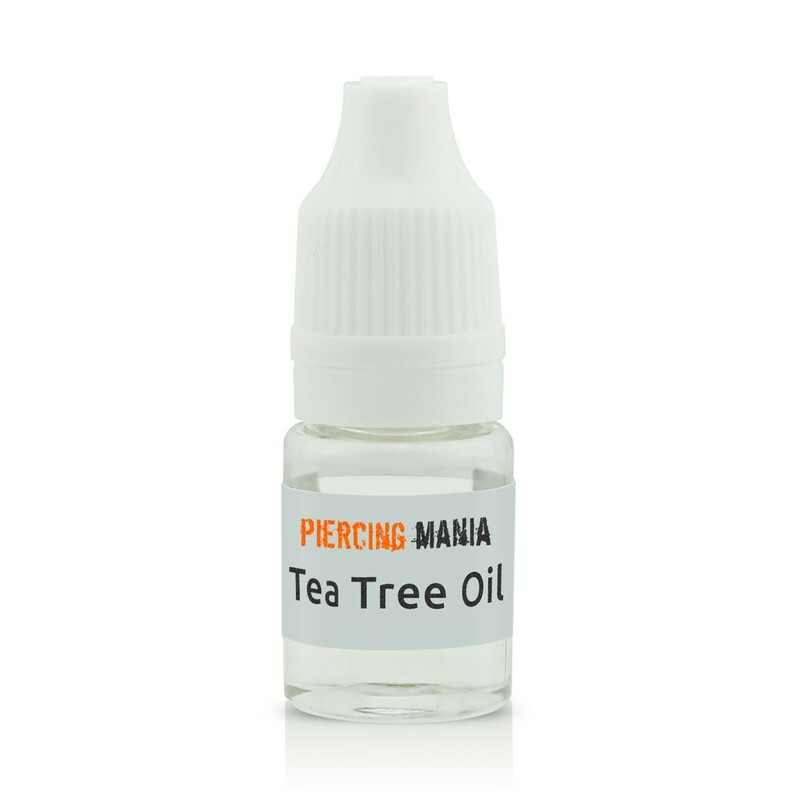 For people with quite an inflamed piercing, a tea tree based product is always a viable solution. Our Almond and Tea Tree Oil works as an effective anti-inflammatory. When you find that your skin around a piercing is just too hot to handle, tea tree soothes the area, and the almond acts as a good diluting agent. If you do prefer to make your own tea tree based solution, you can also try our Tea Tree Oil which has a handy dripping mechanism so you will never spill it all in. Be careful that you do not apply pure tea tree oil to your skin as this can be very uncomfortable. Tip - Try mixing the concentrated tea tree oil with an oil for the best results. Any of the scented or perfumed products are also great ways to keep your piercing smelling fresh, as long as you wait between 2 - 4 weeks for the initial healing process to end. We also have a wonderful DEO cream which acts as a deodorant for your plug, tunnel or taper piercings. To keep your new piercing fresh you can apply these perfumed creams before heading out or just for everyday life. Our original blend comes with hints of vanilla and honey, while we also have a black orchid scented DEO For Her, which will also work against strong odours and keep your piercing smelling fresh throughout the day. The cream is much less irritating and more soothing than spray based counterparts, especially for a new piercing.